In an era between official Bond novelists, EON turned to Christopher Wood to help write both the scripts and novelizations of The Spy Who Loved Me and Moonraker. Nearly three decades later, fresh off the release of his latest book, Sincere male seeks love and someone to wash his underpants, Mr. Wood gives Universal Exports an exclusive insight into his career, his thoughts on Bond and the latest book. Where did you get the idea for your latest novel, Sincere male seeks love and someone to wash his underpants? I got the idea for the novel from my own life (always a good source for a writer). I found myself imagining what it would be like to go out on the pull again, not as a young man but as a mature, divorced male who has decided that it would be a good idea to settle down - again. I thought of my women friends - and how many I could afford to lose if they read the book, my children, my elderly mother and-and I couldn�t wait to start. In the main, I hope, the book is a comedy. How did you come to be involved in the writing of the script for The Spy who Loved Me? I had worked with Lewis Gilbert on Seven Nights in Japan and he rang me up in France and asked me if I would be interested in writing a Bond movie. I thought he was joking. 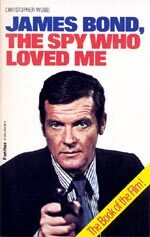 Was it a challenge writing the spin-off novels to The Spy Who Loved Me and Moonraker? At first I was daunted by the idea of writing the novelisations of The Spy Who Loved Me and Moonraker - of trying to combine Fleming with the much larger-than-life movies - but I reread several Fleming Bonds and soon found myself enjoying the experience. Writing the books gave me the chance to put in things that had not appeared in the movies - and improve (I hope) some of the things that had. Were the Bond scripts a highly collaborative process or did you come up with the majority of the ideas for them? There were lots and lots and lots of script conferences and it was vital to come up with lots and lots and lots of ideas. Sometimes a stunt proves impractical, sometimes a location becomes unusable, sometimes an idea is considered to be too like something that has already been done, sometimes a new piece of technology, or a media event, comes along that can be built into the movie. In all this there is, of course, an element of molding other people�s ideas and preferences into a story line that (hopefully) makes sense. Are the similarities between The Spy Who Loved Me and Moonraker intentional? I believe that the key to a successful Bond movie is always doing the same thing - only doing it differently. To that extent I would have to say that any positive similarities were intentional. Hardly surprisingly �Spy�, my first Bond, is my favourite. I think it is Roger�s best 007 - and I believe he agrees with me. Which of your scripts do you find the most satisfying? My favourite script is an adaptation I did of The Double Helix, James Watson�s account of his part in the discovery of DNA. It was never made. Are there any other Bond scriptwriters you admire? I admire any screenwriter who has gone through what it takes to get a credit up on the screen. If you were given the chance to come back and do another script, would you? I would like to polish a Bond script with the brief of injecting as much wit and style as possible. The high-tech elements of 007 enthuse me rather less than his social life. I prefer Jaws in �Spy� to �Moonraker.� There became a danger of..perhaps the word is overbite. What is your favourite line from The Spy Who Loved Me and Moonraker? I enjoy it when Bond says �All those feathers and he still couldn�t fly� as another bad guy disappears over a cliff in a cloud of exploding mattresses. What is your opinion on Richard Kiel�s performance (in both The Spy Who Loved Me and Moonraker) as Jaws? Er. The humour - initially - was not intended. I prefer Jaws in �Spy� to �Moonraker.� There became a danger of..perhaps the word is overbite. 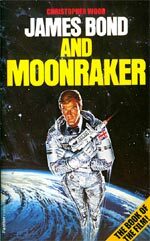 You novelized The Spy Who Loved Me and Moonraker, perhaps the films most different from their novel counterparts. Did you not want to continue writing Bond after you completed Moonraker? I would have been happy to do an original 007 novel, but nobody asked me. Who is your favorite James Bond? I admire Sean and am very fond of Roger. What is your favourite James Bond film? Rosa Klebb. She really scares me. Who is your favourite Bond girl? What is the cheesiest Bond line of the series? Are you still a Bond fan? Very much so. I always write Michael Wilson a critique after each new one comes out. He never replies. A word from the interviewer: On behalf of Universal Exports, I would like to graciously thank Christopher Wood for his enthusiastic willingness to take part in this exclusive interview. It is a beauty! A special thanks must also go to Fred Piechoczek of 21st Century Publishers who basically ran the interview. Thank you very much, Fred! I would also highly suggest you buy copies of Chris�s latest books, Sincere male seeks love and someone to wash his underpants and the soon-to-be-released California, Here I Am from from 21st Century Publishers. A word from the Fred Piechoczek, publisher: I hope the fans will appreciate [the interview]. They might also be interested in his latest books, so we would appreciate if you could point them in the direction of our Web site. We are a modern publisher using the reach of the Internet to sell. We use online bookstores rather than the traditional stores and sell mostly in the USA and UK. Did you know that half the books printed in the UK are pulped unsold? With our approach we avoid that. Questions written by Allan Johnstone, Carey Moore, Jay Harlow and Adam Farrington-Williams; edited by Greg Goodman.